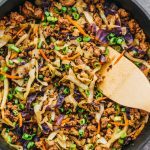 This is a super fast and easy stir fry dinner with ground beef, cabbage, carrots, and scallions. Combine soy sauce and sriracha in a small mixing bowl and stir until smooth. Set aside. Heat a 3 quart or larger pan over medium-high heat. Add canola oil and tilt the pan to spread the oil. Add ground beef and cook until browned, about 5 minutes, stirring frequently and breaking the meat apart. Add cole slaw mix to the pan and stir with the beef. Cook until cabbage is wilted and tender, about 5 minutes, stirring frequently. Reduce heat to medium-low. Pour sauce over the pan, and add ginger. Stir until everything is well-mixed. Add salt to taste, if needed. Remove pan from heat. Stir in sliced scallions, and garnish with sesame seeds. Serve while hot. This recipe yields 9 g net carbs per serving.